message to the White House and beyond. 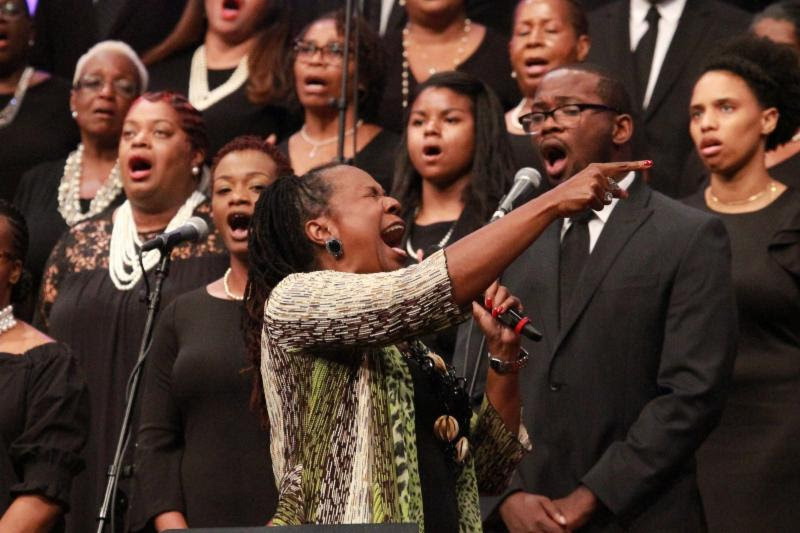 The worship service, intended to stir up those planning to attend the rally, was held at Reid Temple AME Church. 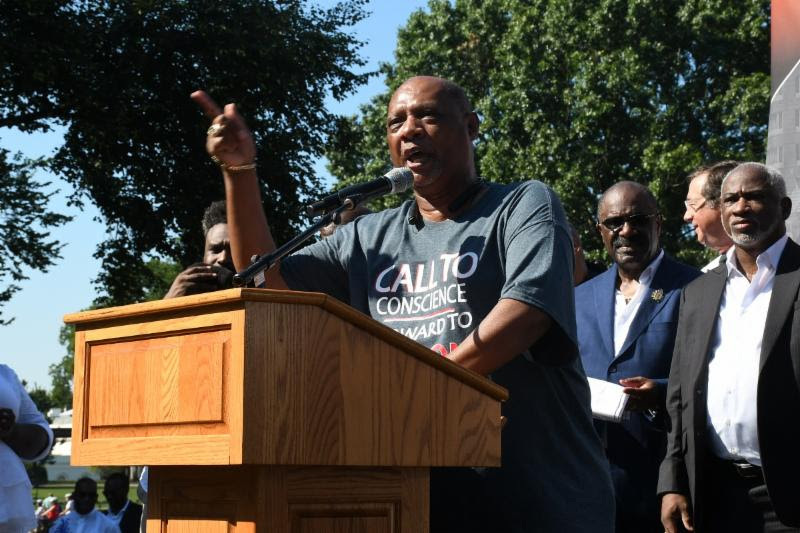 “Tomorrow at Lafayette Park, we not only want the occupant of 1600 Pennsylvania Avenue – who is living in the hands that Black hands built – we not only want him to see us we want him to hear us,” Bishop Reginald T. Jackson told the congregation. Jackson, president of the Council of AME Bishops, is the visionary who called the “Day of Action”. The high-spirited two-day event drew hundreds to a day-long issues symposium before the worship service that drew more than a thousand. After the rally the next day, bishops and church leaders traveled to Capitol Hill to meet with senators and representatives. The activities recalled a 1960s type movement, an awakening of sorts. Franklyn pointed out that African-Americans are statistically worse off than any other racial group in every social category in America. He then paralleled the current pains of Black people to those suffered by the Children of Israel in the Book of Jeremiah as they suffered an economic crisis. “The spring harvest has past and the summer has ended and though we have planted, there has been no harvest,” he paraphrased the Prophet Jeremiah. “When you do not plant it is unreasonable to expect a harvest, but when you plant you ought to expect a harvest. We, African-Americans, have planted. We didn’t just show up here and volunteer. We have been planting,” he said citing how Black people led in building America through fighting in wars and even building the White House and U. S. Capitol buildings. 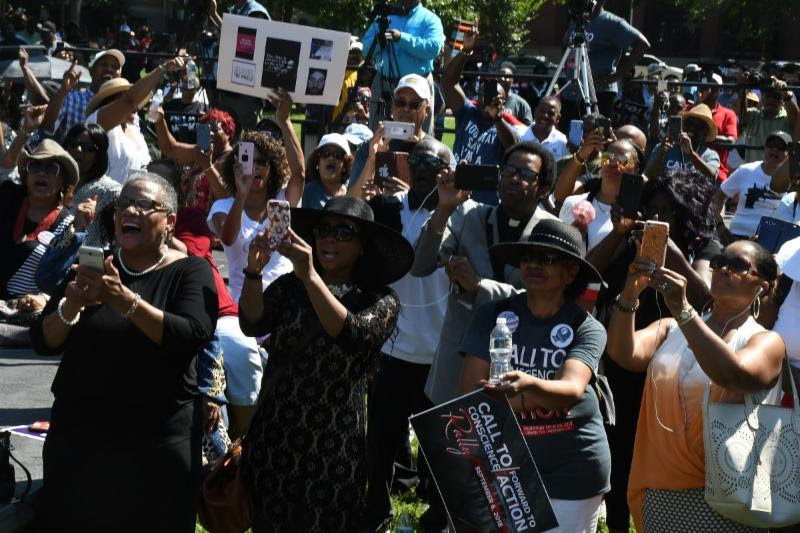 The next day, Lafayette Square was filled with prayers, songs of praise and calls for social Justice Sept. 6 as the Bishops of the African Methodist Episcopal (AME) Church hosted a rally across from the White House to persuade President Trump to change his political ways. The event, entitled a “Call for Conscience/Forward to Action”, featured leaders of the AME church and other national church leaders – young and old. They made it clear that they are organizing a massive get out to vote campaign that they hope will oust Republicans in Congress who simply have rubber stamped the President’s efforts to turn back the Civil Rights clock in many areas. Ingram came to the District with a bus load of congregants because he represents churches in Bermuda and much of the Northeastern United States including New York, New Jersey, Pennsylvania and Delaware. Rev. 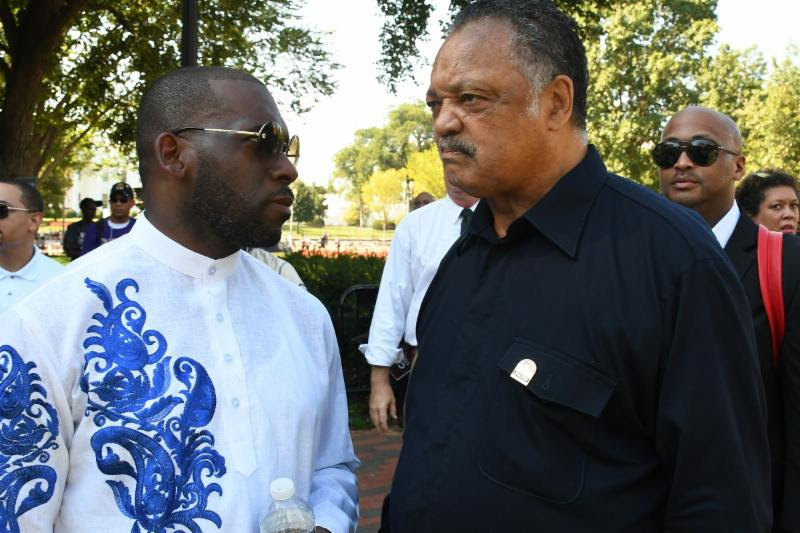 Jamal-Harrison Bryant and the Rev. Jesse Jackson Sr. chat on the sideline during the rally. 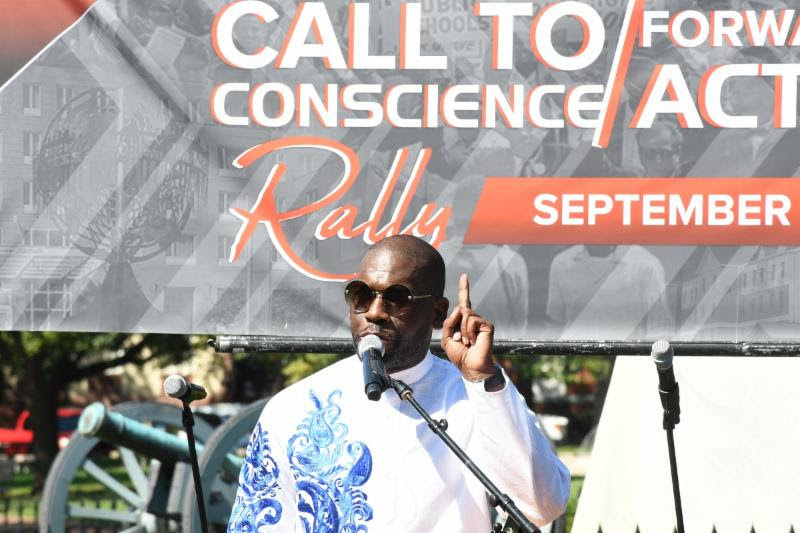 Ingram was among more than a dozen speakers to address the more than 1,000 congregants gathered in Lafayette Park. Speakers included veterans of the Civil Rights movement such as Rainbow/PUSH president/CEO Rev. Jesse Jackson; Bishop Reginald Jackson, president of the Bishops’ Council of the AME Church, who issued and led the call; and Rev. W. Franklyn Richardson, pastor of the Grace Baptist Church in New York and former general secretary of the National Baptist Convention USA, Inc.
Other speakers included Bishop E. Anne Henning-Byfield of the 16th Episcopal AME District; Rev. 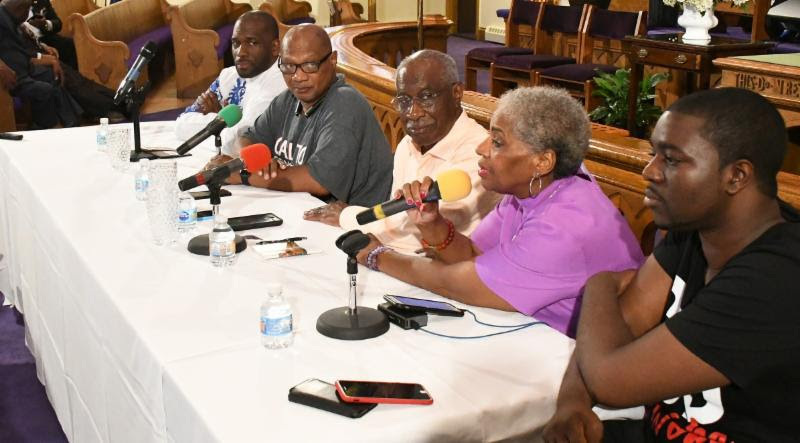 Stephen Green, pastor of Heard AME Church in Roselle, N.J.; Pastor Jamal-Harrison Bryant of Empowerment Temple in Baltimore; radio talk show host and civil rights leader Barbara Arnwine, and poet and Morgan State University Professor Sheri Booker. 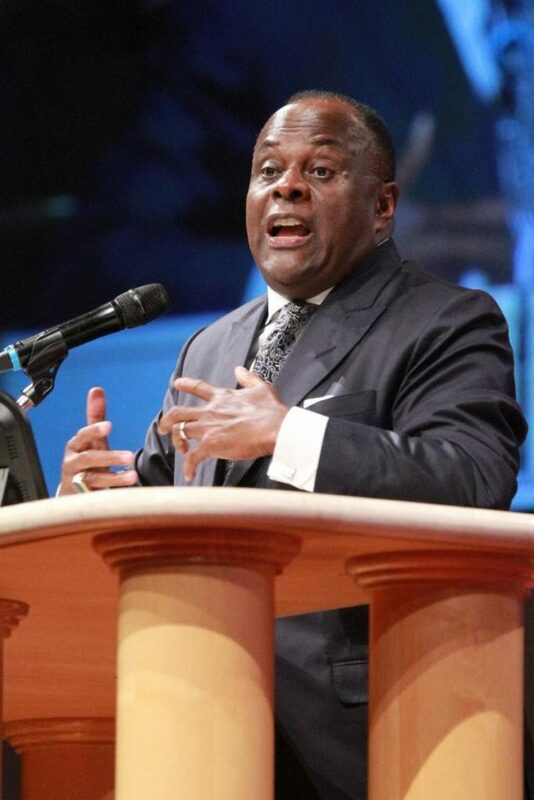 Bishop Reginald Jackson told the demonstrators that even though President Trump recently met with a small group of Black pastors he really hasn’t heard from the heart of Black America. “President Trump has heard from the professional prophets but now he is going to hear from God’s prophets,” he said. Rev. Jesse Jackson said that the best way to even the political playing field with Trump is at the ballot box. “November 6th, that’s our date and destiny: Ayanna Pressley, Massachusetts; Ben Jealous, Maryland; Stacey Abrams, Georgia, Andrew Gillum, Florida; Mike Espy, Mississippi,” he said, pointing out major races around the nation with key African-American candidates. During a press conference held at the Metropolitan AME Church in Downtown DC, Bishop Reginald Jackson and other church leaders talked about the importance of the election and how they plan to organize get out to vote rallies in local churches across the country. During a press conference after the rally the Bishops talked about formulating a nationwide campaign to get out the vote. Bryant said that they had received a call from the White House in which Jared Kushner wanted to speak and set up a future meeting. 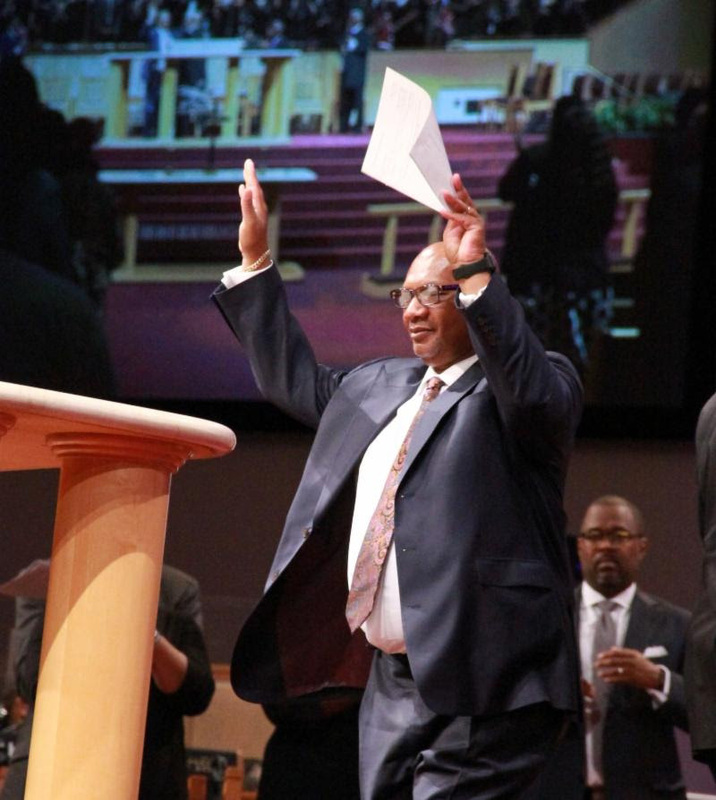 But Bishop Reginald Jackson said the church is interested in real progress – not “photo ops”. Pastor Jamal-Harrison Bryant; Bishop Reginald T. Jackson; Senior Bishop McKinley Young; Bishop E. Anne Henning-Byfield and Rev. Stephen Green answer questions during a press conference at Metropolitan AME Church.